Nice work. Keep us updated and some more details would be great. The reason it’s automatic in the first place is actually so I could program and debug the core cell without having to push keys all the time to test stuff. In the final version (Final, yeah right, as if I finish anything) the effects will be controlled by keyboard instead of chance. The audio is also slightly lower fi than the original sample audio, which I’ll have to fix. At that point I might find it suitable to release this thing to the public. 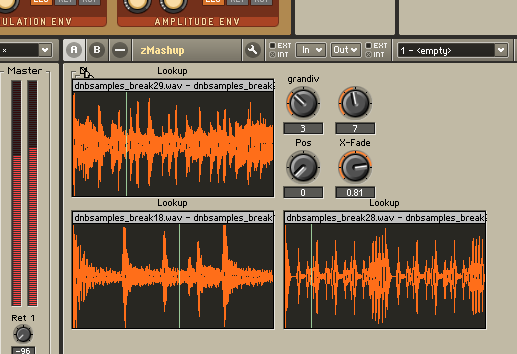 And right now it using the Sample Lookup module, which is only for pre-sampled material. I’m planning to add support for using this thing as an effect to mash any audio. 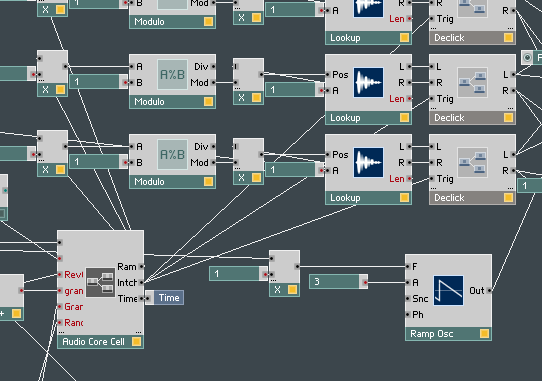 Also watch out for a possible upcoming post about a neat Reaktor instrument made by Trash80. This page was previously hosted on http://gameboygenius.8bitcollective.com/wordpress/2009/10/24/zmashup-homemade-beat-masher-audio-sample/ (*).